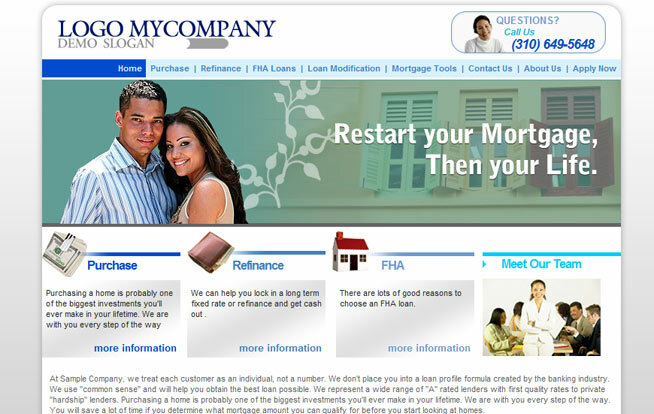 Mortgage Website Success (MWSS) is an all in one site that offers all of those things that any mortgage industry professional needs to get business off the ground or take it to the next level. The one stop shop provides a number of different services that start with basic website building, and end with lead generation and there’s a whole lot more in between. One stand out feature with MWSS is the fact that they’ve got social networking integrated into their services, something that’s lacking with some other mortgage website builders at the moment, which means they’re keeping up with all of the trends in marketing. The design features they offer for their website building are fairly standard, but it’s really the marketing options they offer that set them apart and make them a site to check out! Lead capturing tools – there are pop-in tools, visitor tracking tools and live help modules to help capture new leads! There are safe and secure 1003 application forms that can be installed on the website to give clients the option to submit for more information, and this generates leads for mortgage brokers as well! Those that want to have a custom website designed with different features like these can submit their requests for MWSS to quote and complete. To sign up, mortgage originators have the option to choose from purchasing an annual plan or a monthly plan, plus paying a setup fee. Depending upon the web design package selected, the costs vary. MWSS is based in Los Angeles and there are various ways to contact them including live chat, phone or email.